This dress is from Christian's Fall 2009 Collection. Jasika looked lovely at the Breast Cancer Research Foundation Party Sponsored by BlackBerry and Verizon Wireless on April 29th at the Waldorf-Astoria in New York. Project Runway Season Four designer Sweet P (one of her new designs is above) will be one of the judges for the "Discarded to Divine" Fashion Design Contest in San Francisco on May 7. Click here for details. Click here for a new interview with Kevin Christiana. 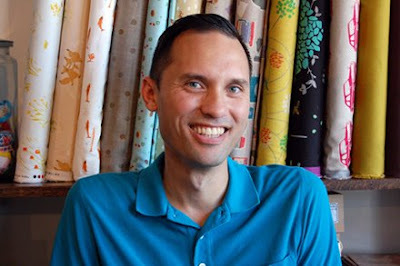 Kayne Gillaspie will serve as a judge for the O'More College of Design 11th Annual Fashion Show at the Tennessee Preforming Arts Center on May 7th. Click here for more information. Jennifer Diederich is designing a custom gown for actress Kellyn Lindsay to wear at the Cannes Film Festival. Click here to follow the story. Rami Kashou will be one of the judges for the Orange County Rock Icon Design Competition on Saturday. Click here for more. 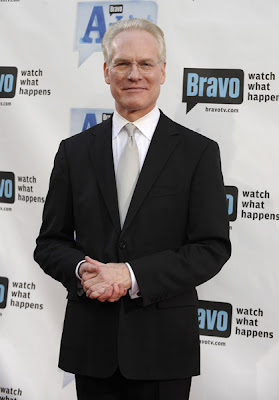 Bid on "Lunch with Tim Gunn" at the Darien Connecticut YMCA Spring Benefit on Saturday. Click here for more. Click here for a report from Tim Gunn's visit to Dallas yesterday. I just wanted to let you guys at Blogging Project Runway know that I am hosting Fashion Hacking: Open Working Studio on May 10th which is open to the public. 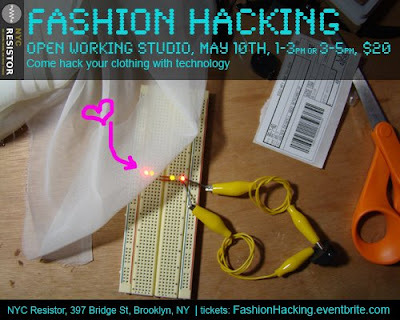 I will be bringing a bit of Project Runway to my hacker group, NYC Resistor on May 10th when we host Fashion Hacking: Open Working Studio. Come and hack fashion with us. BYOC (bring your own clothes) and we’ll have the tailoring tools, sewing machines, conductive thread, LED’s, soldering irons, and the Laser Cutter to help you hack clothes into fashionable technology. Fashion designers and hardware hackers will be on hand to help you. This is an open working studio which means that you are free to circulate, work on your own project and look at other projects. Come to session 1, come to session 2, come to both sessions. Also check out Diana's book here. Project Runway Season Two designer Andrae Gonzalo will be teaching sewing classes at Reform School in Los Angeles. Click here for details. BPR's own Christine Haynes is also on the schedule. 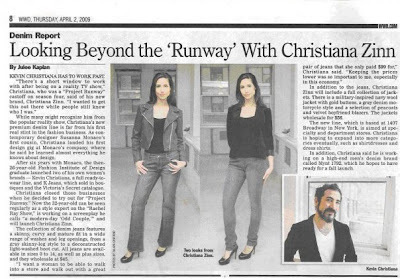 Click here for a new article about "The Fashion Show" from the New York Post. Thanks Mark. Heidi has designed skins for LG Phones and hosted a launch party in Los Angeles on April 28th. Click here for more including video from the party. 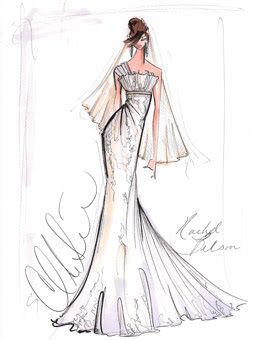 Brides.com features Christian's sketches for Uma Thurman, Rachel Bilson, Amy Adams and Zooey Deschanel. Click here for more. Thanks Laura G.
Michael Kors has opened a new flagship store in London. Click here for photos. Attention Dallas, Tim Gunn will be at Kate Spade NorthPark Center on Wednesday from 1-3 PM and at The Galleria on Thursday from 6-8PM. We'd love a field report and photos. Entertainment Weekly asks if "fashion-reality" shows are over. Not for me! 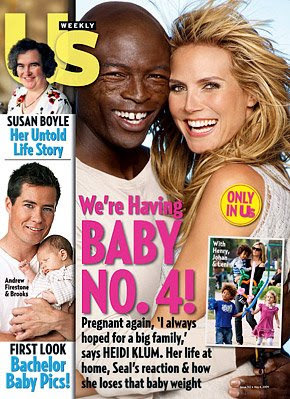 Heidi admits that she and Seal are hoping for a girl. Heidi is also on the cover of the June issue of Ocean Drive magazine. Click here for the story from JustJared. Nick Verreos gave a "How to Dress for the Workplace" talk at "Out For Work" last weekend. Click here for more. Daniel Franco served as a judge at the California State University Northridge TRENDS Fashion Show. Click here for more. Kevin Christiana served as a judge at "Project Earth Day" in New York. Project Runway Season Two designer Heidi Elnora (Standridge) will be at Rock the Runway in Birmingham on Friday. Click here for details. 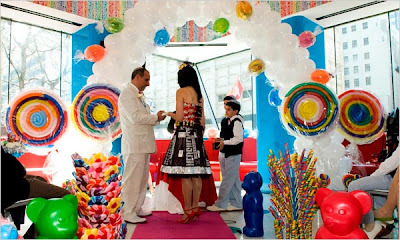 Kit's "Eye Candy" dress was worn by a NYC bride on April 5th. Click here for the full story. Don't miss the slideshow. Tim Gunn will serve as the Commencement Speaker as well as receive an Honorary Doctorate degree from The Corcoran College of Art + Design on May 23rd. Details here. Attention designers: There is still time to send in your application for Project Runway Season Seven. Deadline is April 30th. Click here for more information. my show was AMAZING! it was so beautiful and perfect and worthwhile and just...plain...magic! 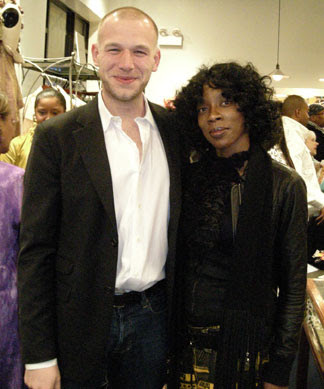 Part 1 / Episode 11 / GNTM 2009 - MyVideo Project Runway Season Three designer, Robert Best appears in this episode. Of course, Heidi is adorable. Thank you Yireh. Project Runway Season Four winner, Christian Siriano has been very busy. Where does he get the energy? On April 23rd, Christian attended a screening of "Obsessed." More photos here, and here. Christian also donated a custom-designed cocktail dress to benefit the American Ballet Theater. Beginning on Sunday, through May 11th, enter code "MM09" when you check out at Moody Mamas to receive a 30% discount. 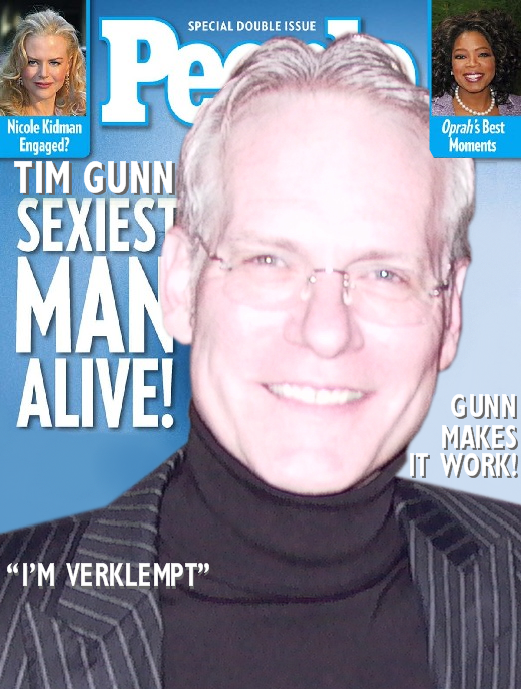 Tim Gunn is featured in the May 4 issue of OK! magazine. Jezebel has more. Steven Rosengard will be designing fashions for the next Miss Puerto Rico Pageant. Click here for the press release. Thanks Jimmy and Susan. This article from the New York Daily News includes more information about Lifetime's new programming as well as this gem from Tim: "I just want to express my huge relief that 'Project Runway' has come out of the ether and landed at Lifetime. It's thrilling for all of us associated with the show. I've never worked with such extraordinary, thoughtful, compassionate and just plain smart people ever." 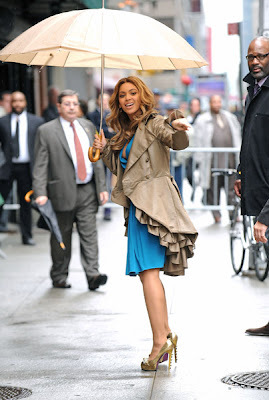 Rain in NYC yesterday caused Beyonce to reach for this fabulous coat by Jillian Lewis. A similar coat from Jillian is available here. Leanne Marshall's line for Bluefly will be eco-friendly. Click here for more. Click here for a new interview with Tim Gunn. 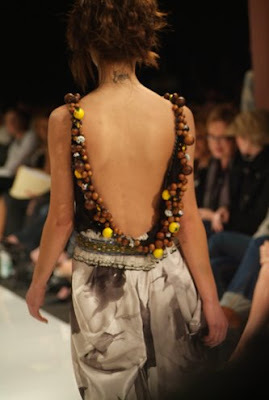 Click here for Seattle Fashion Week coverage of Blayne Walsh. Thanks Julia. Click here for Rondi's recap of the Project Runway Canada Finale. Season 6 Debuts August 20! Pictured from L to R at the big annuncement: Tim Gunn, Andrea Wong, Nina Garcia and Bob Weinstein. Photo: Thos Robinson, courtesy of Lifetime Networks. NEW YORK, NY (April 21, 2009) – Lifetime Television sews up the summer with the highly anticipated Emmy®-nominated and Peabody® Award-winning hit series Project Runway, premiering on Thursday, August 20, at 10PM ET/PT. Produced by The Weinstein Company and Bunim-Murray Productions, host Heidi Klum, mentor Tim Gunn and judges Michael Kors (leading fashion designer) and Nina Garcia (Fashion Director of Marie Claire Magazine), will guide sixteen new contestants as they show off their design skills to see who makes the cut for Fashion Week. Filmed in Los Angeles and New York, Project Runway also features influential guest judges from the worlds of fashion, music, film and television. "I am a huge fan of Project Runway and could not be happier that Season Six will be premiering on Lifetime, the #1 network for women," said Andrea Wong, President and CEO, Lifetime Networks. "The talent in this all-new season is nothing short of amazing, and I can’t wait for all of the fans to see the incredible work of these brilliant designers." Models of the Runway, an exciting new companion series, will air at 11:00PM ET/PT, beginning August 20, immediately following Project Runway. Each 30-minute episode will give fans a behind-the-scenes look at the reality competition – from the models’ perspective. Viewers can experience the drama, anxiety, joys, tears and frustrations as the models themselves face elimination each week and compete for a cash prize and photo spread in Marie Claire magazine. So it's a Thursday night, 10:00 p.m. run for Season 6. We can't wait! 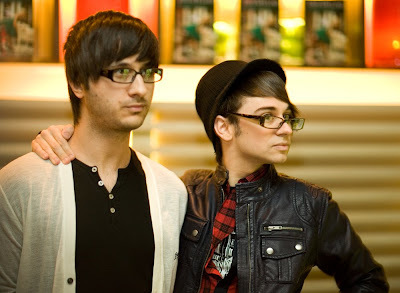 Freelance photographer Katie Sokoler went out this past week and captured some great shots, including this one of Christian Siriano and boyfriend Brad Walsh at Tori Spelling's book release party. 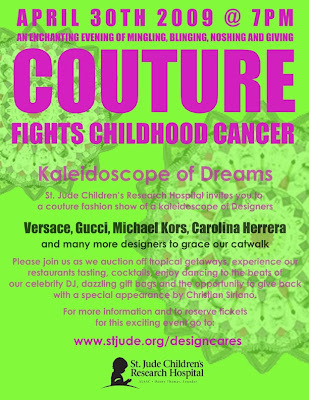 Christian is participating in a great benefit event for St. Jude's Hospital called Design Cares where he will recreate a "dream evening gown" design from one of the St. Jude's patients that will be modeled and walked down the runway by his winning Season 4 model Lisa Nagri. Tim Gunn continues to be the primary font of new information concerning Season 6. This time, he tells Style Hop that the Models of the Runway show "will air during the 30 minutes after Project Runway and will follow Heidi’s mentor-ship of the models, much like mine with the designers.” Style Hop also reports that the premiere date for Season 6 will be revealed "later this week". We'll wait and see if Harvey Weinstein's previous reveal of August 15 has stood firm. UPDATE: See post above. Kara Janx has a sample sale going on this week, featuring 50 - 80 % off her spring/summer collection. It has been a crazy few weeks for us at Wes Feld. Thursday, April 16th marked the grand opening of the new Yankee Stadium. After several meetings with the Yankees, including Ms. Jenny Steinbrenner, we created a great little wardrobe for each of the the staff members of the luxury suites. The looks included a raglan-cap sleeved dress with ruffled shirt yoke, a relaxed trouser and striped shirt with piped bias yoke, and a pleated wrap skirt and striped shirt with shadow ruffle. It was down to the last second sewing over 170 pieces in just under a month and tailoring each of the garments to every single staff member. We have to especially thank Stella Zotis who is an angel sent from fashion heaven. Even though she was feeling a bit under the weather, Stella spent several late nights with us making sure everything was finished for opening day. We adore and are forever greatful to her! We also wanted to thank our dear friend Brian Dargiewicz who also came out to the rescue! He's an amazing guy, learning how to sew buttons on the spot. Phewwwwf..... it's finally done and we can go back to working on our own collection!!! Paired with his recent promise to make one of the judges wear a winning dress, it sounds as if we may be in for some Season 3 type drama! More of this to come, we're sure. Terri Stevens and Steven Rosengard attended the grand re-opening of B Boutique in Chicago. Click here for the story from Second City Style. Nick Verreos will be at UCLA for "Out For Work" today. Click here for details. Are you looking for the final episode of Project Runway Canada? Click here to watch. Click here for Johanne's recap. Click here for an interview with Brian Bailey. 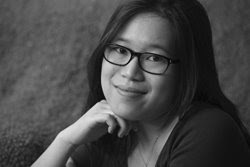 Click here for an interview with Sunny Fong. Click here for an interview with Jessica Biffi. Project Runway season five designers Wesley Nault and Daniel Feld were judges at a fashion competition in Springfield Illinois. Click here for details and a photo of the winning garment. Lil looked gorgeous Wednesday night in this Kara Janx Riley Dress. Click here for details. Here are some more pics from Jerell's show at St. Louis Fashion Week. I saw that Autumn already sent in a few pics of her in that fabulous dress. All of these pictures were taken by photographer Harvey Jackson. Jerell was so fantastic!!!! Exceptionally handsome, with the most beautiful skin. He was outgoing, friendly, and very fun. 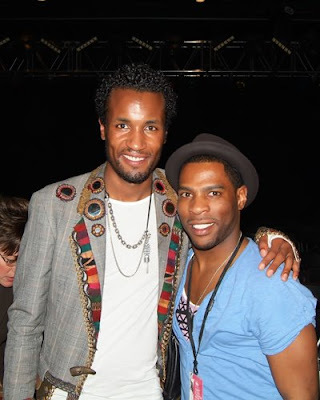 We all had a great time with him at STL fashion week. His collection was amazing and the pics cannot come close to showing how beautifully the clothes moved down the runway. It was a true pleasure to meet him. He is so gracious and outgoing. Everyone LOVED working with him. Christian Siriano visited New Canaan yesterday. Click here for more from the Connecticut Post. Mychael Knight will be appearing at the grand openings of three new AJ Wright stores in the Atlanta area. Click here for details. "You want to know what's really holding up the start date," asked Gunn. "Bravo has a new show on called The Fashion Show. And Lifetime doesn't want to start until that is over with. I guess they think people won't watch two fashion shows. I don't know why. I would." What is the one thing you think will blow us away on the new season of Project Runway whenever it airs? "There is one challenge where the outcome will send the blogs reeling. It is unprecedented in Project Runway history. I am still full of incredulity about the whole thing - about who wins and who goes home. All I can tell you a certain judge says she would like to wear the winning dress. Well, you know we auction off the winning dresses at the end of the show for charity. I am going to bid and get that dress and make her wear it. I don't care how much it costs, I'm going to get it. This challenge is spine-tingling. You will be spellbound. My jaw was in a slack state." E! confirms Heidi Klum's pregnancy and also announces the return of Project Runway to NYC. Congratulations Heidi and Seal! Click here for the story. Blayne Walsh will be showing at Seattle Fashion Week on Saturday. Also noteworthy is the collection of Logan Neitzel. Friday is the taping of "Launch My Line" in Los Angeles. There will be a Kara Janx sample sale in New York City next Wednesday, April 22nd. Click here for details and location. Christian Siriano and Michael Kors will be at Fashion Cares on April 30. Click here and here for more from Christian Siriano's fashion show in Chicago last week. Is Heidi Klum Expecting Baby #4? Click here for the story from InTouch Weekly. I just wanted to let the BPR community know that starting today I will be writing a DIY Fashion column for Craft magazine that shows how to follow runway trends on the cheap by making them yourself. My first article, DIY Fashion: Reinventing Hosiery, looks at styling hosiery for the summer drawing inspiration from Prada, Burberry, Gossip Girl, etc. All of my DIY fashions are easy and quick so that anyone can make them with any level of sewing skills. It's hard to keep up with all of the news today. Bravo has introduced several additional programs including scripted shows. 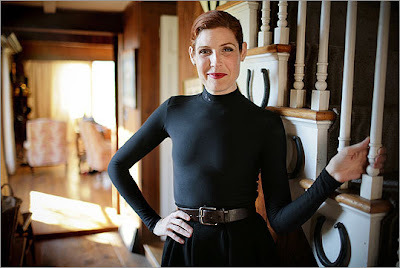 One for Project Runway fans to look forward to is all about Laura Bennett. Click here for the full press release. Here is a well-organized breakdown of the new and returning shows. It's kind of hard to keep everything straight. Conspicuously absent from the list is Tim Gunn's Guide to Style. 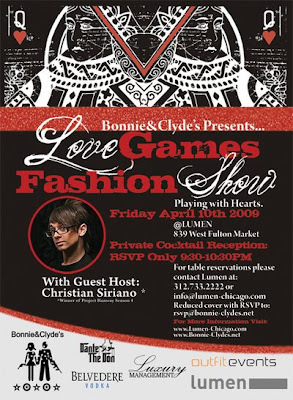 Christian Siriano was in Chicago for a fashion show last Friday. Click here for the story from our friends at Second City Style. Click here for a new interview with Isaac Mizrahi about filming "The Fashion Show." Finally, in what will be the final post regarding this matter, Kenley pleads guilty. DIVA is excited to invite you to a FREE taping of a brand new celebrity-version of a "Project Runway"-style show LAUNCH MY LINE! As a DIVA audience member, YOU are the judges of A NEW BRAVO TV FASHION COMPETITION and find the next hot fashion designer through a series of high stakes CHALLENGES!! The show teams up EXPERT DESIGNERS WITH CELEBRITIES WHO WANT TO DESIGN. Each week, the teams will create garments and show them off to the studio audience. THE BEST PART: DIVA will raise money for EVERY member or our guest who attend the free taping of this show! PLEASE CHECK IN UNDER "DIVA" so OUR GROUP WILL BE PROPERLY CREDITED FOR FUNDRAISING PURPOSES. - Must be 18 years old and appear to be no more than 45 years old to attend the show. - No electronic device allowed (cell phones, cameras), no large bags allowed inside the studio. - Please arrive on or before scheduled time. - Dress Attire: Club attire or like you will be attending a runway fashion show to be admitted. No white clothing, no shorts, celebrity prints or trademark designs/logos allowed inside the studio. Upscale attire is required! PLEASE ONLY RSVP TO THIS INVITE WITH YOUR NAME AND NUMBER OF GUESTS OR NAMES OF YOUR GUESTS IF YOU ARE SURE THAT YOU ARE ATTENDING THIS TAPING. RSVP: here with subject "LAUNCH MY LINE" with your name and guests name(s). Thanks and we would see you there this Friday! 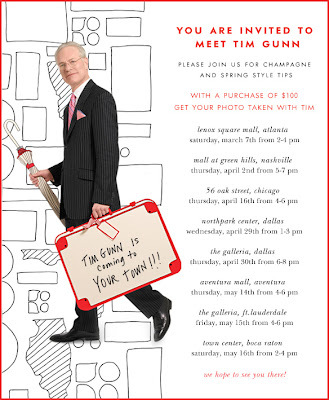 Tim Gunn will be in Illinois this week. Tim is speaking at Illinois State University on Wednesday night. On Thursday he will visit the Kate Spade store at 56 Oak Street. Bravo is currently in production on another Fashion-Reality Show called "Launch My Line." This is in addition to "The Fashion Show." 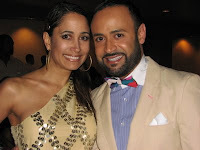 Click here to read advice for Project Runway season seven hopefuls from Nick Verreos. Click here to read about Bravo's merchandising strategies. Kenley Collins is scheduled to appear in court today. Don't miss Tim tonight on "The Biggest Loser." Click here for a new interview with Jack Mackenroth. Click here for Rondi's recap of Project Runway Canada, Episode 11. Click here for an interview with Iman from The Canadian Press. Attention Designers: Project Runway Season Seven is now casting. The application deadline is April 24th. Semi-final interviews will be in Atlanta, Chicago, New York City, Los Angeles and Seattle probably between May 8th and May 25th. For more information visit Bunim/Murray. Jennifer Diederich has updated her etsy shop with new designs for Spring. Click here to see everything. Click here to discover "Five Reasons to Love Project Runway." Can you think of more? Nick Verreos has been in San Antonio Texas co-hosting the "Imagine 2009" Fashion Show. Nick's fabulous sister Rita covered the event for LatinFusionTV.com. Click here for Nick's blog entry. 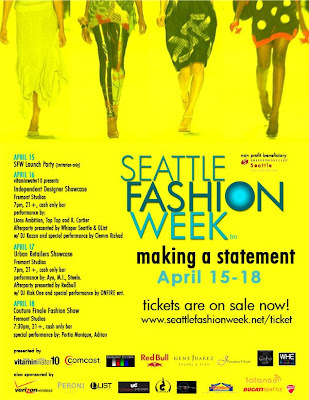 so...next sat the 18th i will be showing my fall/winter 2009 collection during Seattle fashion week and let me tell you it is SOMETHIN' ELSE! very new stuff for me in the this collection. a lot of tailoring and sophistication but still very Blayne. its is a fusion of native american and vampire hybrid feel with a lot of detail work. I'm so excited for this launch! i encourage everyone who can to get on a plane and come to this event! its going to be amazing! Project Runway Season Four designers, Rami Kashou and Kit Pistol enjoyed the A-List Awards. The Cut has a fresh new interview with Daniel Vosovic. Attn: NYC - Go shopping with Gretta Monahan on April 16th-17th. Click here for details. Click here for a new interview with Season Five's Jerry Tam. Tune in to NBC for the Makeover episode! Be sure to tune in to Bravo April 15th at 10:00 PM for the second annual "A-List Awards." 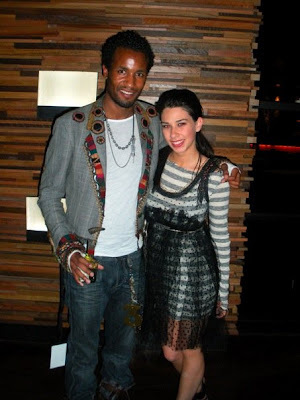 Autumn Sij worked with Jerell Scott at St. Louis Fashion week and he made her a custom dress! Adorable. She also sends these photos from the event. Joe Faris will be one of the featured designers at "Secrets of Style" on April 9th in Detroit. Click here for the latest from Laura Bennett at The Daily Beast. Hilarious. Click here for Rondi's recap of Project Runway Canada Episode 10. Click here to bid on a pair of Dolce and Gabbana sunglasses that Amanda Fields picked up at the Elle magazine gift suite after the Project Runway finale show. Season Five design team Wesley Nault and Daniel Feld send us this update - thanks guys! We hope all is well for you at Blogging Project Runway. It was really great seeing you at the season 6 finale show. As promised, here is some of our latest work. We have been fortunate enough to design costumes for a couple of great events. First, we have designed costumes (photo above) for the Detroit Institute of Art Gala. Enjoy this video of Elisa Jimenez in Austin and click here to read the full article. Austin Scarlett is no longer with Kenneth Pool. Click here for the story from InStyle. The Kent State University Museum in Kent Ohio is presenting a collection of Michael Kors designs through February 2010. Click here for more information. Did you do laundry as a child? My mother was very intense about making me and my sister very independent people, so we did laundry and cleaned the house. Our washing machine was in the basement. My most vivid memory is definitely finding a 7-inch salamander in the machine after doing the wash. I shrieked and did the laundry all over again, twice. 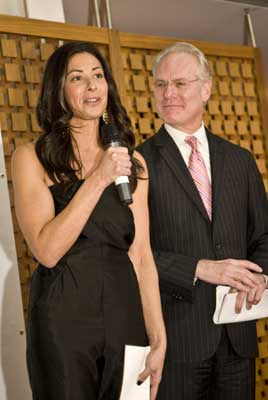 Tim Gunn co-hosted a charity event for Breast Cancer Awareness yesterday at Diane von Furstenberg's studio. Click here for more information and lots of photos. Project Runway Season Four designer Kevin Christiana is launching a new denim line. Click on the image above to enlarge. Congratulations, Kevin! Project Runway Season Six Premieres August 15th! 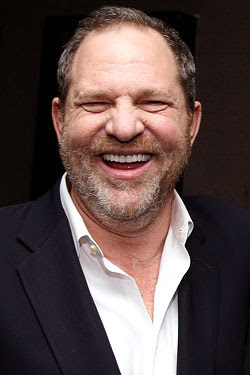 Click here and then click on the "Harvey Weinstein" link for the interview on Ryan Seacrest's Radio show yesterday. 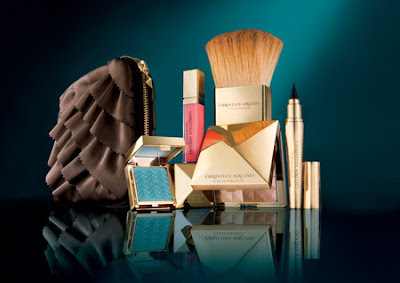 Christian Siriano has designed a limited edition make-up collection for Victoria's Secret. Click here for more information. Is there anything Christian can't do? Laura Bennett is quoted in this Forbes article. This article also mentions a new reality show all about Laura on Bravo! Look for Laura on Monday's episode of Oprah - "The Secret Life of Moms." Meanwhile, I am watching the finale of season three on Bravo this morning - it never gets old - and seeing lots of promos for "The Fashion Show." Heidi Klum is on the cover of the new Delta Sky Magazine. 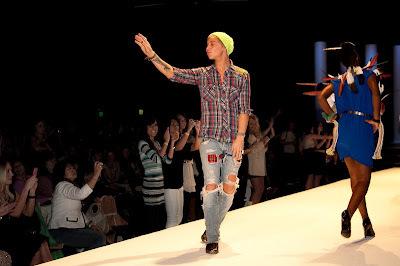 Blayne Walsh will show his latest designs at Seattle Fashion Week on April 18th. Also worthy of note is the collection of Logan Neitzel. Project Runway Season Two designer, Andrae Gonzalo helped to create the costumes for the Metropolitan Educational Theatre's production of "Seussical: The Musical" in Torrance, CA. Click here for more information. Korto Momolu will be in Memphis on April 18th. Click here for more information. Click on the image to enlarge for more information. Meet The Cast of "The Fashion Show"
A Note From Tim Gunn! Project Runway Season Six Premiere This Summer!